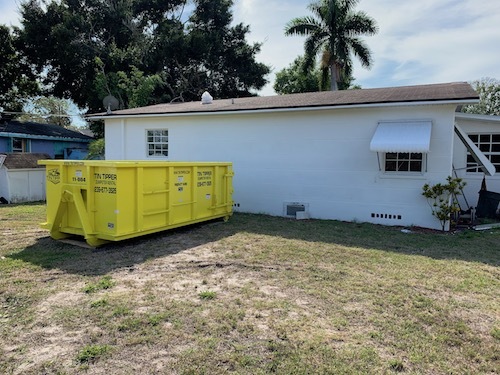 Our Dumpsters are large enough (or small enough) to accommodate almost any Fort Myers residential clean up, move out, yard clean up, remodeling project, or disaster restoration project. On many occasions, same day delivery! 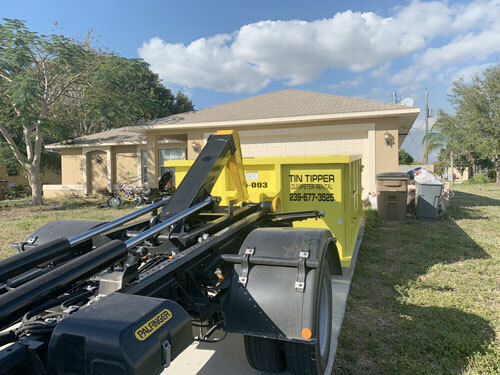 Tin Tipper Dumpster Rental based out of Cape Coral specializes in renting dumpsters at competitive dumpster rental rates to Fort Myers Residences and Commercial properties. Our locally owned and operated dumpster rental company rents 11 yard, 15 yard, and 20 yard roll off bins throughout Lee County. Benefits of a Roll Off Dumpster Rental in Fort Myers? Our Roll Off Dumpsters will yield the same amount of space as those ugly construction dumpsters, however they wont be an eye sore. Our bins will be a handy tool for property owners and contractors alike. Many homes in Fort Myers that have dumpsters on their property are usually performing a clean-out or remodeling. If you’ve ever remodeled your any portion of your home, you know how much debris and waste can be created and accumulated. Having a Tin Tipper Dumpster while performing this type of work in Fort Myers will make your life so much easier! Instead of wasting your time and money, while utilizing your friend’s pickup, many individuals will rent a container during their project. All you have to do is toss the trash from the remodel into the bin and your done with it. No need to have waster lingering throughout your Fort Myers house. Cleaning your garage will accumulate a lot of trash, your standard city trash pick up will not take most of this junk. When customers get tired of wasted time and money taking trips to the dump, they bring the dump to them in Fort Myers. Tin Tipper Dumpster Rental can make that happen, and make your next project that much easier! Tin Tipper is confident that we have the right dumpster size for your job at the right price. We currently have 3 various sizes of dumpsters available for rent and for you to choose from. 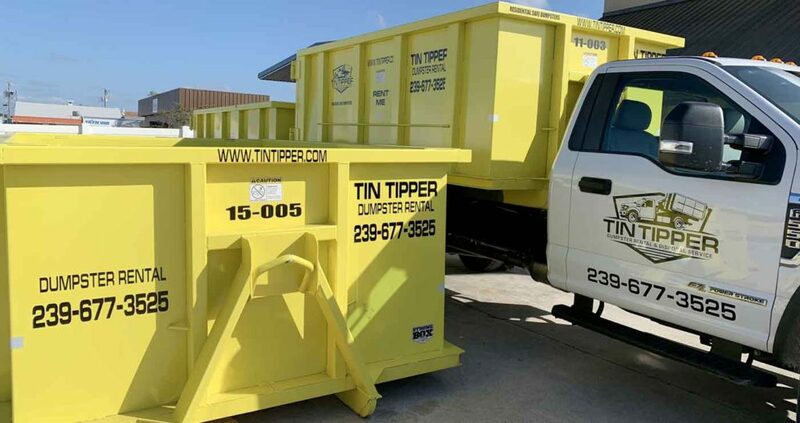 Tin Tipper Dumpster Rental has 11-yard, 15-yard, and 20- yard dumpsters ready to go and just one call away 239-677-3525. Roll Off Dumpster Rental : order with ease! Some companies have a hard time with making promised drop off and pick up times. 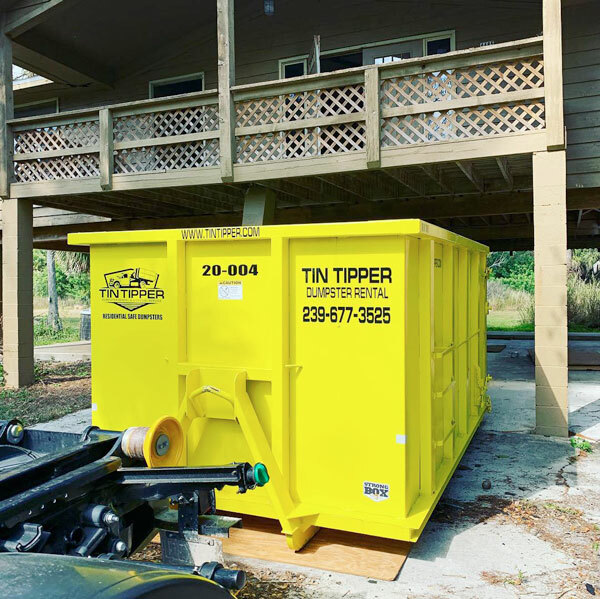 Here at Tin Tipper, you can rest assured that your fort myers dumpster rental will be on time, everytime. At Tin Tipper, we will use the latest technology to ensure and make your dumpster rental ordering and scheduling process a breeze. To get a better idea of what may be need for your next project, we have a form on the bottom of this page that you can fill out. Just let us know about the type of project you’re performing. Be specific, and we will get back to you ASAP with pricing and any information you may need regarding your next Fort Myers Bin Rental. Contact us to Schedule a Dumpster Rental Today! We will always help you choose the right dumpster to help with your next project. We will know what container size will work for all different types of project, you may be performing in Fort Myers, Florida. We provide 11, 15 and 20 cubic yard dumpsters for rent in Fort Myers, FL. We have currently delivered and met many satisfied customers needs with our dumpsters to neighborhoods in Iona McGregor, The Villas, off of the Daniels corridor, Plantation, Gateway, and more. 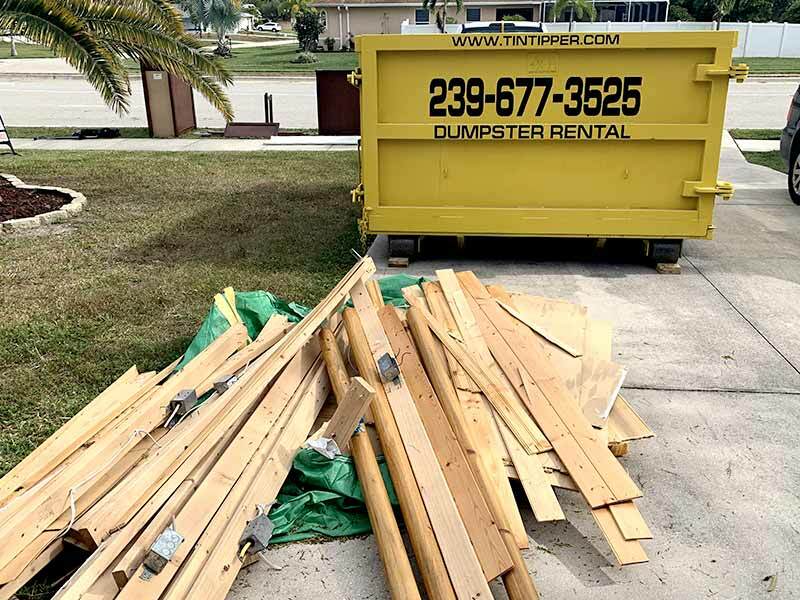 To learn more or to rent a dumpster in Fort Myers, call us today. On most occasions your next dumpster rental can be delivered the very same day! call 239-677-3525. 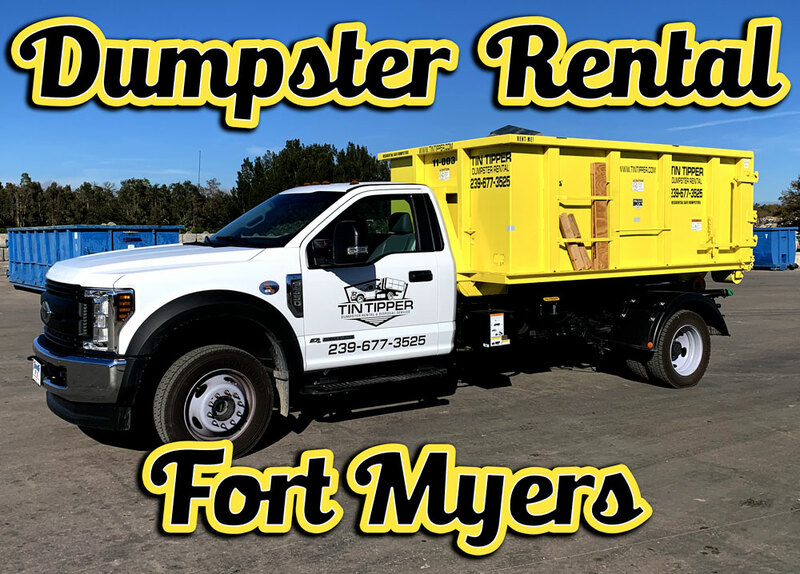 Ready to rent a dumpster in fort Myers, FL ? Call us today for a dumpster rental in Fort Myers! Fort Myers, FL outranks all other florida cities for the most sunny days! Check out our Fort Myers weather! Our Fort Myers beaches have more variety of shells than anywhere in the world! Check out our fort myers visitor center. Our winter Resident gave us light! Mr Thomas Edison spent a lot of his time right here in Fort Myers, FL. Visit the Fort Myers Edison home. 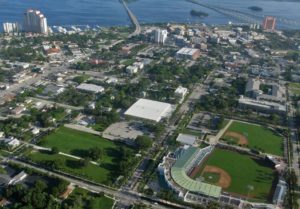 Fort Myers has become an area known for corporate headquarter location. Chico's, Hertz, Gartner. Check out more fun facts about Fort Myers, FL! Lee County landfill and waste disposal facility. Resource Recovery Facility in Fort Myers - This facility accepts Construction and Demolition, Horticulture, and General Municipal Trash. fixing up your home? Cleaning out your property? or just throwing out junk that has been accumulating over the years? This will call for something larger than your trash can! 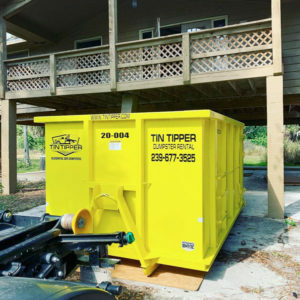 Tin Tipper Dumpster Rental of Fort Myers can help! 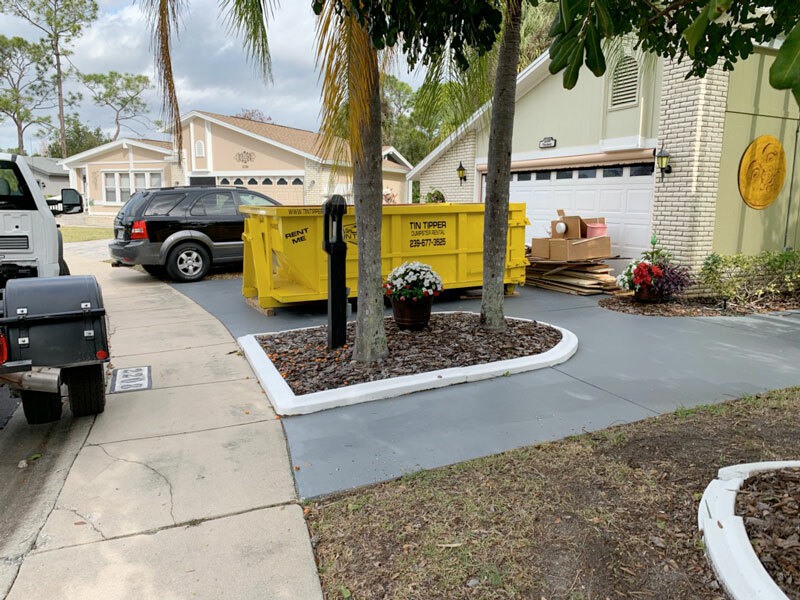 As Fort Myers most google reviewed dumpster rental company, we aim to making your next waste and debris removal as easy and hassle-free as possible. Our dumpsters offer the home owner or commercial property a temporary option of clearing out a lot of stuff! Our roll off container range from 11 cubic yards to 20 cubic yards. We will take care of your property as if it’s our own, from our initial contact with our team into our delivery process to our hassle free pick-up. 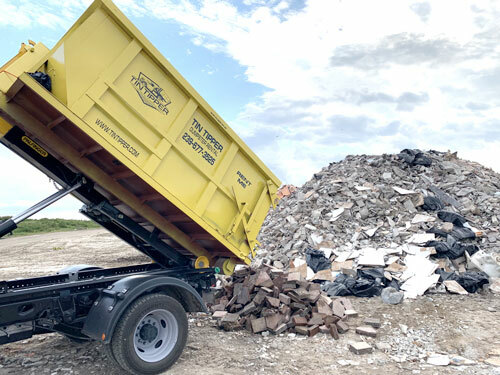 Our team of experts will ensure the dumpster being dropped off in Fort Myers will be placed exactly where you need it. This also includes placing it on boards to prevent any damage to your property. We aim to provide an exceptional of customer service and your satisfaction is our #1 priority. We pride ourselves on offering the cleaning, safest, and damage free dumpster to your Fort Myers property. Best of all, we promise "No surprises and No hidden Fees! All of Tin Tipper Dumpster Rental contractor customers are repeat clients. We are the best top choice for limited space and community or HOA policies and restrictions. Our dumpsters are perfect for your small to medium sized jobs. 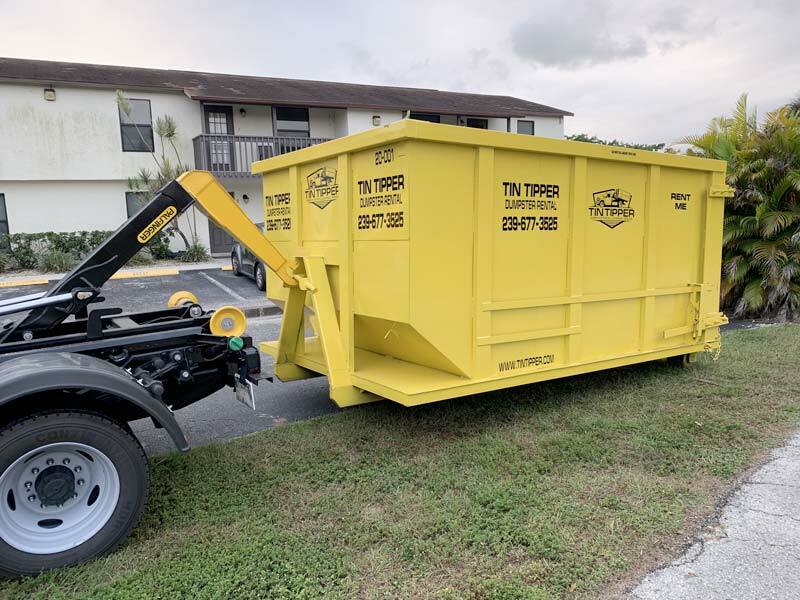 Our Timeliness on delivery and pick-ups, residential sized containers, our rental period, and the ability to give our repeat and loyal customer discounts has helped us become the top dumpster rental option in Fort Myers. Feel Free to call us for any question or information you may need at 239-823-7855. When you order a dumpster, The first question you should ask is if they are a broker. You will be shocked by how many companies on the internet advertise local services without even owning a dumpster in Fort Myers. They will obtain your information, order from a local contractor, and keep their cut of the high dumpster rental rate. Here is why renting from Tin Tipper is a smarter choice ? no miscommunication that could lead to damaged property, wrong pick up or drop off date, and best of all Better prices, local professional / caring service. We walk the talk! Our customers have raved and ranted over our service and communication, this has simply put us above the competition in Fort Myers, FL. You will receive a call or text notification when the dumpster is ready for delivery and/or pick-up. Our residential & commercial bins are built to fit in your tight and sometimes required spots. Yep, we can even roll them inside of the garage. Work sites can be hard to navigate, that’s why our containers are approximately the size of a large van. We will ensure that our dumpster will look good, therefore keeping your home looking good! By keeping our containers free of any rust, dirt, etc... We can ensure that our bings wont cause any damage to your property. We guarantee your dumpsters will be clean and maintained on arrival. Renting a dumpster in Fort Myers is easy! 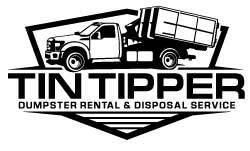 Tin Tipper : Dumpster Rental is ready for your call and to began handling all of your dumpster rental needs! Our dumpster experts can help get you the correct size for your project! Get Ready for Your Fort Myers Dumpster Delivery! Our experts will schedule a delivery, at that time we will protect you driveway with boards to prevent any damage to your home from our dumpsters. Your Fort Myers Dumpster Project is now complete! Email us, Call us, or Text us to schedule a pick up. Our team will be at your property to pick up the dumpster within 24 hours.